Bare bones. A pale collection of skeletal matter and a host of aboriginal legends are all that remain of this mighty beast that once fell from the skies of South Island, New Zealand with the striking force of a cinder block falling from an eight story building. 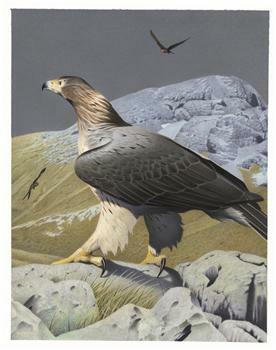 Harpagornis moorei, Haast's eagle, was the largest eagle to ever take flight. Weighing more than thirty pounds, a big female would have a body nearly five feet long and a wingspan close to ten feet. Keep in mind, that's a ten foot wingspan on a bird of prey with rather short wings and a long tail in relation to body size. The reason this beast of a bird was able to survive in it's dense forest home was it's chief prey item. The moa, a giant flightless bird that had no chance against the tyranny from above that this mighty eagle delivered. 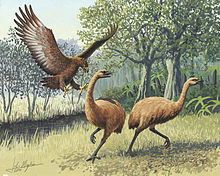 Unfortunately, there is another creature even more terrible and destructive; a creature neither the moa nor the Haast's eagle were prepared for. Around 1400 CE, man delivered the killing blows to both of these wonderful creatures. First, they mercilessly hunted the moa to extinction. Then they cleared the dense forests that the eagle called home. With the loss of it's main prey item and the destruction of it's habitat, the majestic Haast's eagle faded into extinction. Now all that remains are bones. Bare lifeless bones and a few images created by artist's who dream of a time when death fell hard from the heavens.